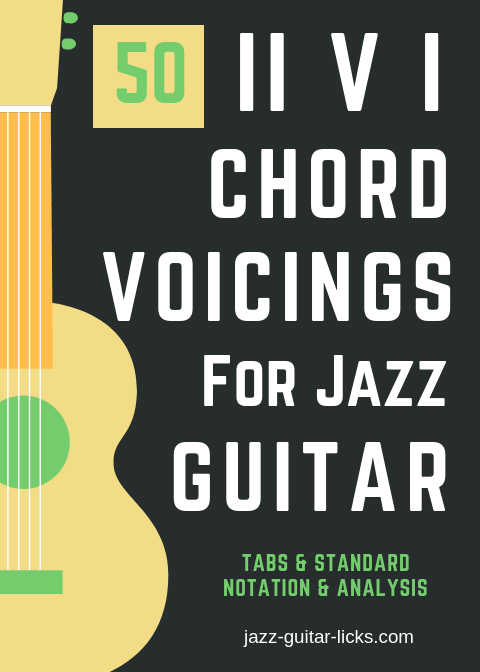 You will find in this page 5 exercises to learn to play different jazz guitar chord voicings over the most used chord progression in jazz, the famous II-V-I sequence. 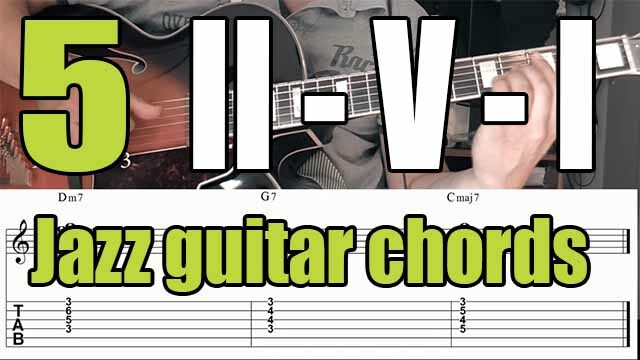 Bar 1.Fmaj9 (1, 3, 7, 9) diatonic substitute for Dm7. Bar 2.Diminished 7 substitute for G7 (1, b5 , bb7, b3). Bar 3.Second inversion of Cmaj7 (drop2) (3, 7, 1, 5). Bar 1.Drop 2 Dm7 inversion, fifth in the bass (5, 1, b3, b7). Bar 2.Diminished 7 substitutes for G7 (1, b5, bb7, b3). Bar 3.Drop 2 Cmaj7 (1, 5, 7, 3) and its second inversion (3, 7, 1, 5). Bar 1.Rootless Dm11 third in the bass (b3, b7, b3, 11). Bar 2.G7#5 (7, 3, #5, 1). Bar 3.Rootless Cmaj7 (5, 7, 3, 5). Bar 2.Two diminished 7 substitutes for G7 (1, b5, bb7, b3). Bar 3.Drop 2 Cmaj7 inversion (3, b7, 1, 5). Bar 3.Only one note moves to get from Cmaj7 seventh in the bass (5, 7, 3, 7) and Cmaj13 (5, 7, 3, 13).